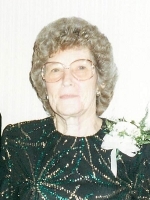 GUILDERLAND – Edna G. Greulich, 89, of Guilderland, passed away Wednesday, May 4, 2016, with friends and family by her side, holding her daughters hand. Edna was born in Schenectady, the daughter of the late Frederick Male and Elizabeth Swatling Male. She lived in Guilderland all her life. She and her late husband operated Greulich’s market in Guilderland for many years, and she continued operating the market after her husband’s death until just a few years ago, ending after 66 years of operation. Edna was predeceased by her husband Arthur Greulich, and by four sisters and three brothers. She is survived by her daughter Bonnie L. Greulich; and by her twin granddaughters Ashley and Alicia. The family would like to extend a special thanks to everyone who went on this journey with Edna and family for the past five years. Bonnie I’m so sorry on the passing of your mother. It was a great pleasure to know and work for her. She treated me great and I’m glad to have known her. She thought the world of you and your two daughters. If I can be of any assistance to you please don’t hesitate to contact me. Again I’m very sorry and I will keep her in my prayers. I’ve known your mother most of my adult life and she was good to me. I am so sorry for your loss, if there anything I can help with let me know. My thoughts and prayers are with you and your family. Bonnie I am sending hugs your way. The stress and worry are over. Edna is being cared for by the Lord and smiling down on you and the girls. She knows how much you did for her. Now when we meet out we can talk about happier times. Hi Bonnie, I am so sorry to learn of the passing of your mother. I met your mother August, 1976 when she brought a 12 step program to the area. I am so indebted to her for this because it changed my life, perhaps saved it. I never met you but your mother spoke of you with pride and love, along with your two daughters. She was a wonderful woman and it was a privilege to have known her. I will keep her in my prayers that she is at peace. So sorry on the passing of your mother. Our thoughts and prayers are with you and your family. Dan, Debbie, Marty and Vickie.